Pushed by tight budgets and growing concern about orbits increasingly littered with debris from past missions, companies have started getting serious re-using things where it makes sense and designing space systems to be sustainable, not single-use and disposable. Re-use in space emerged as a major theme of this week’s annual Space Symposium industry gathering in Colorado Springs. SpaceX, or Space Exploration Technologies Corp., Elon Musk’s rocket company based in Hawthorne, California, has made the biggest splash about re-using technology by trying to land its spent rocket booster on a floating barge in the ocean so it can explore what salvageable parts can be used again. But SpaceX isn’t alone in looking to re-use rocket parts. 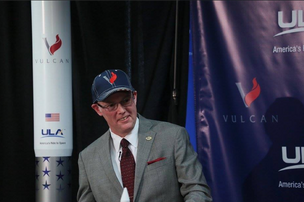 At the Space Symposium, Centennial-based United Launch Alliance revealed its designs for a new line of rockets it plans to build, called Vulcan, and it features re-using its booster engines in an effort to bring launch costs down to $100 million. Rather than land a booster, ULA plans to have the first-stage rocket engines descend back into the atmosphere on a parachute to be caught by a helicopter and recovered for later refurbishing and re-use.